Easterseals is working to create a world where each child born with a disability is given the support necessary to participate fully in life and to have dreams and hopes, successes and achievements. Explore our service for children today! 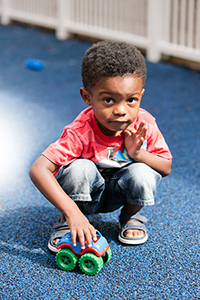 Our Child Development Center Network is the largest provider of inclusive child care in the United States. Easterseals serves thousands of young children and their families in a setting where children with disabilities and special needs comprise 25 percent of enrollment. Early intervention services help young children with disabilities achieve their goals in cognitive, social/emotional, communicative, adaptive and physical development. Services may include occupational therapy to help an infant learn to hold her bottle, physical therapy to help her learn to roll over, or speech therapy to help her learn to eat. Most early intervention services take place in the home or, in the case of working parents, at child care facilities in the local community. Jalea, a child with spina bifida, learns, plays, and reaches milestones at her local Easterseals child development center. Read more about the exciting milestones Jalea is reaching at school. Haven was born with significant delays due to complications at birth. Today, she is a thriving, joyful, and energetic kid. Read more about how Easterseals was there for Haven from the very beginning. At Easterseals, we know the first five years of life lay the foundation for a child’s long-term well-being and overall success. Get a free, confidential online screening to track your child's development, and more through Make the First Five Count. Get an Individualized Education Plan (IEP) checklist to help your child get the services and supports that ensure he or she can be successful at school. Learn how one mom found a community of friends through Easterseals. Connect with your local Easterseals!